The objective of our investigation was to design a formal mentoring program for novice professors who come from another culture and are recent graduates from a doctoral program. We studied a sample of eight international novice professors in the program to demonstrate its effectiveness. What distinguishes this program from others is that it offers mentoring to help professors both improve the quality of their instruction and adapt to the culture of the country and of the university. The methodology used was that of case study with a design of pre-test, intervention, post-test. The professors who participated in the mentoring program demonstrated an improvement of 0.95 points (on a scale of five points, p<0.01) in their student evaluations. The principal causes of deficient teaching performance in the novice international faculty were: the absence of pedagogical knowledge and the lack of teaching experience, as well as lack of familiarity with the country culture and the organizational culture of the university. Our study shows that a mentoring program can help improve low student evaluations of novice professors who come from another culture and are recent graduates of a doctoral program. Cultural mentoring, Faculty development, Novice Faculty, Foreign faculty, Teaching mentoring. Mission: ITAM seeks to contribute to the individual's comprehensive education and to develop a freer, more just, and prosperous society. It also aims to become a community in its fullest sense, an institution of excellence and academic freedom, and a high-quality autonomous research center. Goal: Our institution's goal is to prepare and educate men and women who are capable of acting in an informed, rational, responsible, critical way, and committed to creating, managing, and shaping public opinion, institutions, as well as further works. It also intends that these men and women be capable of creating and transmitting knowledge of the highest ethical, scientific, technological, and pr of essional levels, allowing society to become aware of its problems and contributing to their understanding and solutions. The principle values promoted by ITAM’s organizational culture are: excellent performance by all members of the educational community, respect for commitment, punctuality, personal effort, gender equity, and respect for the truth. One of the strategies that the ITAM School of Business adopted in order to achieve the internationalization of its programs was to hire foreign professors who were recent graduates of doctoral programs, who had studied at universities outside of their home countries. While this strategy met the objective of internationalizing the programs of studies, the majority of novice foreign professors received low student evaluations. ITAM faculty are evaluated in every course they teach by their students. the system of student evaluations of professors uses a scale of 1 to 5 points, one being the lowest score and five being the highest. the minimum acceptable score is 4.0. professors who receive a score of between 3.0 and 3.9 are considered to have problems with their teaching, and the university of fers them support to improve their teaching performance. professors who receive an average evaluation score of lower than 3.0 in two consecutive semesters are not of fered a permanent contract. In order to solve the problem of novice international professors receiving low teaching evaluations, ITAM designed a mentoring program based on prior research into the field, a summary of which follows. Mentoring has been widely used in both the workplace and the academy with the goal of improving performance. In its original conception, mentoring refers to a positive relationship, in which the mentee (protégé) learns pr of essional skills from a more senior person (mentor) [2,3].This type of mentoring is called “one-to-one” and generally is of fered by someone who has more seniority or experience, whether an immediate superior or a senior colleague. More recently, Zellers et al. have considered mentoring as a relationship of mutual learning, characterized by trust, respect, and commitment, in which the mentor supports the pr of essional and personal development of the mentee by sharing his life experiences. According to these authors, the mentor should be: a coach who teaches, of fering challenges and feedback; a role model who demonstrates values, attitudes, and behaviors; and finally, an advisor who of fers guidance, support, and strategies to help the mentee address his shortcomings. Both the early and current literature on mentoring agree that the process can have multiple benefits not only for the mentee (protégé) but also for the organization: an increase in productivity and organizational stability [5-7]; retention of valuable employees ; support in the development of the pr of essional career [8,9]; guidance for people with cultural diversity [5,10]. These benefits are precisely those that the ITAM School of Business hoped to achieve with the mentoring program. Recent research into mentoring has focused on multiple mentoring and cultural mentoring. Various authors agree that in the academic environment, it is beneficial to use a constellation of mentors and not only one [11-13]. Another current tendency within mentoring programs is to consider cultural differences, acknowledging that if the mentee belongs to another culture and if his native language is different from that of the country in which he is going to teach, he may suffer from culture shock. Finally, another current tendency in mentoring is to focus on diversity and minority groups, for instance professors of color, latinos, or women [4,10,14]. The use of mentoring to support novice faculty - professors who are teaching classes for the first time - has been of wide research interest. Some authors, including Angelique, Kyle and Taylor  and Sorcinelli , consider that mentoring should focus on of fering support so that the mentee can improve his teaching at the same time that he receives advice about how to reach tenure, learn to manage his time, and define his research goals. Other authors [17,18] consider that mentoring new professors should focus on of fering advice about teaching and research. The majority of full-time university professors begin their teaching careers as graduate students in a doctoral program. Many of them find their first year teaching to be problematic and stressful . In addition, this year is a process of change; the professor works to reorganize the knowledge, values, attitudes, and concepts that he developed during his academic formation, until he is able to develop his own style of instruction. • Guidance about how to achieve work-life balance. Regarding the results achieved by of fering mentoring to junior faculty, researchers have found that these programs can be effective in increasing faculty productivity and retention . Additionally, through mentoring, new faculty can acquire the necessary skills to triumph in academic life . Mentoring programs thus diminish the anxiety provoked by the adjustment of new faculty to the university . According to Feixas , the principle problems manifested by new professors in their teaching are: encountering students who reject the advice of the professor; not knowing how to answer students’ questions or not mastering the subject matter; being unable to explain things in a clear or interesting manner; getting the students to think for themselves; being confronted by a student who received a bad grade; distinguishing in a group of students who is working and who is talking; having to revisit basic concepts without demoralizing students; having language problems (for foreign professors); lacking experience in public speaking and giving presentations; being attacked with difficult questions by students. Although there have been many studies about the need to support novice professors [15,17,18,20], there has not been adequate research into how mentoring can support a professor’s adaptation to a new national culture and to the organizational culture of the university, in addition to supporting improvement in teaching. Is a mentoring program the solution to the low teaching evaluations of novice professors who come from another culture and are recent graduates of a doctoral program? • Design a mentoring program for novice professors who come from another culture and are recent graduates of a doctoral program; the program’s goals are not only to improve the participants’ teaching but also to facilitate their adaptation to a different national culture and familiarize them with the organizational culture of the university. • Demonstrate the effectiveness of the mentoring program by studying its effects on a group of novice teachers. Our investigation used the case study methodology. Eight novice international professors were analyzed, using interviews and field notes collected during the direct observation of one of their classes. the design of pre-test, intervention, post-test was used to evaluate the results of the mentoring program. For the pre-test measurement, we used the professor’s average score on his previous student evaluations. the post-test score consisted of the score that the professor received on his student evaluations for the same subject, the semester after participation in the mentoring program. In order to of fer transcultural mentoring, we used the nine cultural dimensions of the GLOBE study (2004) for our conceptual framework: power distance; uncertainty avoidance; institutional collectivism; gender egalitarianism; in-group collectivism; assertiveness; future orientation; performance orientation; and humane orientation. Additionally, because we consider them important in the Mexican context, we included two other cultural variables: perception of time and high context vs. low context. The subjects were of fered guidance about managing cultural differences during interviews. During the interviews, the professor was presented with a list of the description of each one of the cultural dimensions considered in the study and was asked to identify if there were similarities or differences between the Mexican culture, the organizational culture of ITAM, and the culture of the country of origin. the goal was for the professor to become aware of the differences; when the professor noted differences, advice was of fered about how to handle those differences when dealing with students. It is necessary to clarify that in this study, when we refer to the Mexican culture, we refer to the region in the center of the country; the culture there is different from both that of the north, which is closer to that of the United States, and that of the south, which has been strongly influenced by indigenous cultures. The subjects who participated in the mentoring program were invited to join by their immediate supervisor. the professors included in the study were doctors who: had received student evaluations of between 3.0 and 3.9 (on a scale of 1 to 5, 1 being the lowest score); lacked teaching experience (novice professor); came from another culture; and had recently graduated from a doctoral program. Table 1 presents the characteristics of the subjects included in the study: their nationality, university where they studied, and doctoral degree received. Table 1: Subjects’ nationality and university where they studied. The participation of the mentors was voluntary. the professors invited to participate as mentors met the following criteria: doctor; senior professor; Mexican; familiar with Mexican culture and the organizational culture of ITAM; received evaluations higher than 4.5 points. Because the School of Business has few professors who meet all of the criteria to be mentors, we designed a one-on-one mentoring program rather than a multiple mentoring program. According to Matthews , when designing a mentoring program it should consider the following aspects: definition and goals of the mentoring; roles and responsibilities of the mentor and the mentee; and the expected benefits for the mentee, the mentor, and the organization. the mentoring program of the ITAM School of Business aimed to improve the quality of the professor’s instruction, and thus to raise his student evaluations to a score higher than 4.0; as a consequence, the university would finalize the hire. the university, in turn, would benefit from the increased quality of instruction and the decrease in faculty turnover. We chose to use a formal one-on-one mentoring program that would last six months. • to identify the strengths and the areas of opportunity in the professor’s instruction, in order to suggest how to use the strengths to better advantage and what changes to make that would improve the teaching performance, and, as a consequence, the course evaluations. • to inform the professor about: Mexican culture, the organizational culture of ITAM, and the characteristics of a School of Business as opposed to the field in which the professor completed his doctorate. • the immediate superior identified the professors who had received student evaluation scores between 3.0 and 3.9. He discussed the mentoring program with the candidates and explained how participation could help to improve their teaching performance. • the Department Chair invited senior faculty who met the criteria to serve as mentors in the program. • the junior professor sent an email to his assigned mentor, asking for his guidance; this step was designed to make sure that the mentee (protégé) was committed to the mentoring program. • the mentor observes the mentee teach a class. • the mentor writes a formal report of the teaching observation divided into the following sections: teaching strengths of the professor; weaknesses; suggested changes to improve each weakness; conclusions; general suggestions. • the mentor meets with the mentee to give feedback about the observation. • In a following meeting, the mentor advises the mentee about how to plan a class and how to choose different teaching techniques according to the course objectives. • In another meeting, the mentor of fers the foreign professor information about the culture of the country where he is teaching, emphasizing the principle differences between Mexico and the culture of origin. Additionally, he of fers him/her information about the organizational culture of the university, placing emphasis on how professors customarily deal with students. • At the end of the semester, we compared the evaluations received by the professor for the same course before and after participating in the mentoring program. • the mentee was told that he could contact the mentor as needed for any future questions or follow-up. 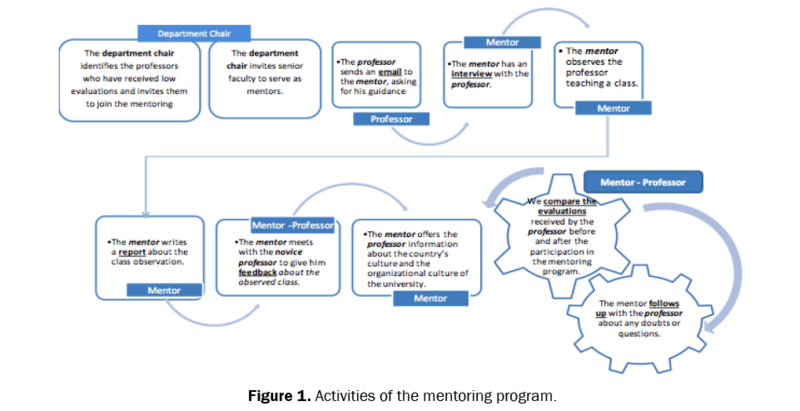 Figure 1 presents the sequence of the mentoring program activities. Figure 1: Activities of the mentoring program. To test the effectiveness of the mentoring program, we recruited eight participants. We compared the student evaluation scores for the chosen course before (pre-test) and after (post-test) participating in the program. the results listed in Table 2 shows that participants improved an average of 0.95 points in their student evaluations. This difference is statistically significant (p<.01) based on a pair-sample t test. This increase means that instead of receiving a score considered deficient (3.19), the average increased to 4.14, which meets the university’s minimum requirement of 4.0. These professors can now aspire to obtaining tenure. Table 2: Improvement in the evaluations of the professors. Three of the professors who participated in the study taught a new subject in the following semester, rather than the course for which they received mentoring. In these three cases, the professors improved an average of 1.6 points from the pre-test evaluation, which suggests that once these professors were able to adapt to the new culture and overcome the shortcomings in their teaching, they were able to transfer the skills they had learned to teaching new courses. During their observation of the mentee’s class, the mentors identified the principle problems weakening the mentee’s teaching. the mentors relied not only upon the model proposed in Harden and Crosby , which describes the roles that a teacher should play, but also upon their own experience in the classroom and in dealing with students. Below we present the main teaching weaknesses shared by the majority of the professors who participated in the mentoring program. • Inability to use different techniques to encourage class participation, including discussion of cases, group work, video analysis, etc. • Lack of familiarity with the application of one’s field of knowledge to the country in which one is teaching, for example the peculiarities of the Mexican financial system. In the interviews that of fered transcultural mentoring, we found that the closer the culture of origin was to Mexican culture, the lesser the cultural shock and the faster the adaptation to Mexican culture. For example, the Latin American professors from Peru and Uruguay were the two who most easily understood the Mexican culture because of Mexico’s similarities to the rest of Latin America. Likewise, it was relatively easy for the Cuban professor to understand the cultural differences between his native country and Mexico. the Spanish professors believed that it would take several years for them to understand some aspects of Mexican culture. An interesting result of the study was finding that, contrary to what many might expect, it was easy for the Indian professor to adapt to Mexican culture because of the great similarities existing between the two cultures. In Table 3 we present the principle differences between the Mexican culture and that of the different professors, with respect to the variables included in the study. Since we based our research on case study, we avoided interpreting the professor’s opinions and instead include direct quotations from our interviews. It is important to underscore that the differences mentioned by the foreign professors only reflect their personal experience and thus cannot be generalized. It took him a year to adapt to the ITAM culture. Unlike Mexico, Korea is a low-context society. the worth of a person is defined by competition. the subject should work hard to achieve their goals. In Korea, unlike in Mexico, the group is more important than the individual. Table 3: Differences in cultural dimensions between Mexico and the country of origin of the professor. The results of our investigation coincide with the findings of Hardwick , Reder and Gallagher , Sánchez-Moreno and Mayor-Ruiz  and Weijden et al  about the importance of of fering mentoring to professors who are recent graduates of doctoral programs because these professors of ten lack teaching experience. Although many authors [11-13] currently recommend of fering multiple mentoring to faculty, our investigation has demonstrated that one-on-one mentoring can still be effective. This finding is important for universities who have few experienced teachers able to serve as mentors. We agree with Peterson et al. that student evaluations of the professor provide an effective measurement for pre-test, post-test evaluations. Student evaluations provide the administration with information they can use to help the professor and guide him, through mentoring; become a more effective teacher in the classroom. Our study suggests that a mentoring program needs mentors who are familiar with the organizational culture of the university; this finding is supported by Wanberg et al. and Eby et al. , who argue that considering the organizational values i6n the design of the program positively affects the results of the mentoring. Additionally, the results of our study support Ragins et al. , who argue that the effectiveness of a mentoring program is strongly influenced by the quality of the mentors. In the academy, many have developed mentoring programs to improve the teaching performance of professors, but almost none of these programs address the problem of culture shock. An original contribution of our work is that we consider how culture shock can affect a novice professor who is unfamiliar with the culture of the country in which he is teaching. One limitation of our research is that we based our analysis upon case studies. Our findings about cultural differences, therefore, only reflect the personal experience of the individual professor, and thus we cannot affirm that his experience corresponds with the reality of the national culture of the home country or of that of Mexico. Nevertheless, our findings largely coincide with the findings of the GLOBE study. the GLOBE study found that the Latin American countries form a block with similar characteristics, thus it is not unexpected that the professors who experienced the least culture shock were Peruvian and Uruguayan. He principle causes of poor teaching performance in novice international faculty who had just finished a doctoral degree were: lack of familiarity with the culture of the country and with the organizational culture of the university; and lack of pedagogical knowledge and teaching experience. to solve these problems, we designed a formal one-on-one mentoring program, in which the experienced professor advised a foreign novice professor during six months. the eight subjects who participated in the mentoring program improved an average of 0.95 points (p<.01) (on a scale of 5 points) in their student evaluations. Moreover, the professors who later taught a subject different from the one for which they received mentoring also improved in the student evaluations of their teaching. This result suggests that once the teacher has understood the cultural differences and overcome the shortcomings in his teaching, his overall teaching performance improves. That is, the professor is able to transfer what he learns in the mentoring program to teaching future courses. An interesting finding in our study was that the Indian professor did not experience culture shock because of the great similarity in most of the cultural dimensions between Mexico and India. The Korean professor experienced the greatest culture shock because of the big cultural differences he encountered between his home country and Mexico. Another important factor was his role as professor: in Korea, the role of a teacher is to transmit knowledge without worrying about motivating the student. If a university decides to internationalize its programs of study by hiring foreign professors, its goal might be thwarted if it does not of fer its international faculty enough support to help them adapt to the culture of the country in which they will be teaching. the institution should help them to overcome culture shock through a transcultural mentoring program; this program is most important for those professors who encounter the greatest cultural differences. Moreover, one cannot assume that a foreign teacher who speaks the language of the country will experience few cultural differences; the case of the Spanish professors teaching in Mexico proves this assumption wrong. Additionally, novice foreign teachers who begin teaching classes after finishing the doctoral degree may require advising about the design of their courses and techniques to improve the effectiveness of their teaching. We believe that the success of our mentoring program is due to the fact that it of fered professors support for improving their teaching as well as for adapting to the cultures of the country and the university. A mentoring program can be the solution to low teaching evaluations of novice professors who come from another culture and are recent graduates of a doctoral program. the mentoring program tested in this study can be used by other universities who hire foreign professors who have recently graduated from a doctoral program. We recommend that when universities hire foreign professors, they consider the problems the new professors might have in adapting to the culture of the country in which they are going to teach. We suggest that they give a cultural immersion workshop to the teachers who come from other cultures in order to s of ten the culture shock and facilitate adaptation to the new country. We recommend that universities provide guidance to new teachers about the objectives and content of the courses that they will be teaching and about how to adapt the course to the environment of the country in which they will be teaching, especially when the professor was trained in a different discipline. In order to allow the novice foreign professor time to familiarize him with and prepare the subject, we suggest that the university send him the syllabi for the courses he will be teaching six months before classes begin. Allen TD, et al. Career benefits associated with mentoring for protégeé: a meta-analysis. J Appl Psychol. 2004; 89: 127-136. Reder M and Gallagher E. Transforming a teaching culture through peer mentoring: Connecticut College’s Johnson teaching seminar for incoming faculty. to Improve the Academy: Resources for Faculty, Instructional and Organizational Development. 2006; 25: 327-344. Leslie K, et al. Junior faculty experiences with informal mentoring. Med Teach. 2005; 27: 693-698. Eby LT, et al. An interdisciplinary meta-analysis of the potential antecedents, correlates, and consequences of protégé perceptions of mentoring. Psychol Bull. 2013; 139: 441-476.